Either the good news is that I receive a lot of gifts, or I simply hold on to ribbon for years until I can figure out what to do with it. Such was the discovery I made recently when cleaning out a bin-o-bits I’ve been saving for a while. As mentioned in a previous post, I have a penchant for saving ribbon from packages. I dunno…it just seems a shame to throw it away, especially if it’s wire ribbon! Depending on the length and color, I can sometime reuse it to wrap a package, but if I end up with a piece of 10-12″, then I’m left to figure out what to do with it so I always tuck it back into the bin-o-bits. When a couple of years ago I was looking for some fabulous flowers to dress up one of my hats I immediately turned to search for something that would be in support of fellow Etsysians. I discovered a shop with creations that completely surpassed my expectation. 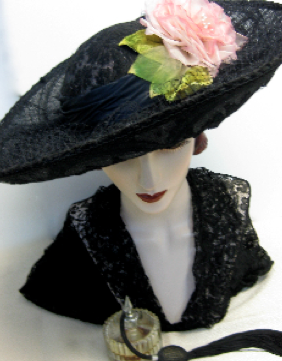 Prepare to be absolutely mesmerized by the beautiful hats adorned with exquisite accoutrements designed and created with an old world expertise and quality surpassed by none!